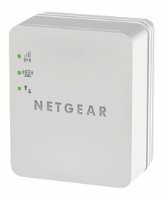 Netgear presents the WN1000RP WiFi Booster, this device will ship for $39.99. NETGEAR, Inc., a global networking company that delivers innovative products to consumers, businesses and service providers, today announced the WiFi Booster for Mobile (WN1000RP). The compact, WiFi Booster for Mobile amplifies WiFi coverage for mobile devices in the home by extending and strengthening an existing WiFi signal, giving consumers the ability to enjoy an improved wireless experience on tablets, smartphones and e-readers. Consumers are leveraging WiFi connectivity at home more than ever before to browse the web, stream movies and play online games on their devices. The NETGEAR WiFi Booster for Mobile improves an existing WiFi signal throughout the home and even outside on the deck or patio, enabling users to move freely around the house while streaming content on everything from tablets and e-readers to smartphones. In addition, the NETGEAR WiFi Booster for Mobile helps consumers reduce the risk of unforeseen mobile data plan charges by easily accessing their home WiFi networks instead of the carrier's mobile networks. In a March 2012 report by Chetan Sharma, researchers found that 90% of tablet owners prefer to use WiFi, not mobile data plans, to get online at home. The NETGEAR WiFi Booster for Mobile enables users to surf the Internet and stream content using WiFi, unconstrained by mobile data plan usage limits. NETGEAR's WiFi Booster for Mobile repeats a 2.4 GHz WiFi signal from existing routers and gateways to boost range and WiFi performance. It has a small form factor and is simple to install with a mobile-friendly browser-based setup and real-time LED indicators helping to determine optimal placement to ensure the best WiFi coverage. With the small wall-plug design and NETGEAR's Push 'n' Connect (WPS) feature, the WiFi Booster for Mobile connects quickly and easily once plugged into a power outlet and provides an instant and secure connection to any existing WiFi network. "Consumers today want the best connected experience, complete with the ability to enjoy online entertainment on their WiFi connected mobile devices throughout the home," said Damir Skripic, product line manager for connected entertainment at NETGEAR. "The NETGEAR WiFi Booster for Mobile enables this experience by significantly increasing WiFi coverage in the home, which is ideal for roaming iPads, iPhones, Android tablets, Kindle e-readers, smartphones or any other mobile WiFi devices."